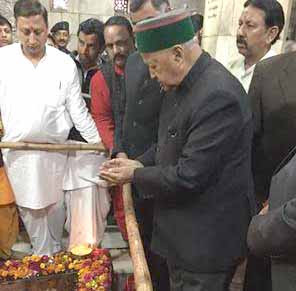 Jawalamukhi : Chief Minister of Himachal Pardesh, Virbhadra Singh, on Tuesday visited the famous shrine of Jawalamukhi in Kangra District of Himachal Pardesh to pay obeisance. Singh alongwith his cabinet collogue IPH Minister Vidya Stokes reached the shrine early morning. He was accorded a warm and rousing reception by large number local baridars of temple who welcomed him at the gate of Jawalamukhi shrine, with traditional musical instruments as he entered the temple. He prayed for the well being and prosperity of the people of the State. Ritesh Chauhan, Deputy Commissioner Kangra and Chairman Temple Trust presented a photograph of Jawala ji to the Chief Minister. Local MLA Sanjay Rattan and Senior officers of the district administration and other distinguished people were present on the occasion.